In the summer of 2014 I left the restaurant industry behind and started a career working for King of Pops. Upon arrival, it seemed that my knife skills were well suited for the job as there was always a bounty of fruit to be prepped. Aside from that, the job also feed my chef driven desire to work with local growers. At that time it was a lot easier to find and utilize local ingredients. Farmers could back their trucks into our loading dock and we would buy as much usable produce they had. These were simple one on one interactions. There was a face to the items we would buy. There were shared talks of what was happening on the farm and what would be available next visit or next season. The greatest part was the knowledge that the money we spent with these farmers was going right back into their farms to grow their business. As the years progressed, thankfully, so did our business. Each week of the season was a mad push to clean as many strawberries as possible or to blend as many blueberries as we could get our hands on. Eventually things changed. The one-off processes would no longer work and we needed to systemize. Through it all, using local ingredients and helping Southern farms has stayed at the top of our priorities. But to source locally it was apparent that we had to first define what “local” meant to us. We wanted it to not be used as just a buzzword but rather a guiding light to lead us to new farms or producers that share our same values and beliefs. With our pop kingdom’s reach stretching all the way to Richmond we knew that local didn’t just mean Atlanta or Georgia but rather the entirety of the Southeast (we are delivering to stores throughout the South & once we drop stuff off can use the empty space for produce). That said, we also accept the fact that not all ingredients can be found here in our region. This corner of the world isn’t known for its cacao trees or growing and harvesting vanilla beans. We don’t have bananas or coconuts within arms reach. Some things have to travel to get here, and that’s okay. For these items we like to know more than the cost per pound or if it’s the best. We want to know that people we work with are doing more than moving product. The same can be said about the products we have been able to source here locally. Our dairy comes from cows that are eating grass 150 miles from our headquarters in Atlanta. All of our citrus comes from Florida a state that shares our southern border. Peaches, blackberries, blueberries, apples, pears, mint, basil, ginger - all sourced from companies based in the South with our eye focusing in on bringing in more and more. This year we wanted to start by showcasing examples of local companies and their impact on the community in which they reside. After kicking around some ideas on how best to do this we decided that finding honey for each city would be(e) a fun and engaging way to introduce our customers to some amazing hard working people and their product. From pollinating our food supply to producing that sweet delicious gold, honey bees are incredibly important and so are the people who keep them. I asked our group of chosen bee peeps some questions about their business and what it takes to keep things humming. From Nashville, TN we have Williams Honey Farms located in Franklin who’s honey has been named “The Best Tasting Honey in Tennessee”. To the east we find R and R Acres - outside of Charleston, SC - who not only bottles honey but also creates soaps and other products so that nothing goes to waste. Moving to the north is Cloister Honey found in Charlotte, NC who is not only making incredible infused honey but venturing into the hemp/CBD honey realm as well. Next is Black Heath Meadery in Richmond, VA whos love of honey has brewed up a very cool business of the ancient art of making mead (think honey beer or wine). Lastly, we found Honey Nextdoor here in Atlanta, GA using hives in the various neighborhoods to make site specific honey. Q: When did you realize you love and/or bees? A: (Williams Honey Farm) In 2008 my wife read an article in the local newspaper about how bees were in trouble. We decided we wanted to help out and bought 2 beehives. 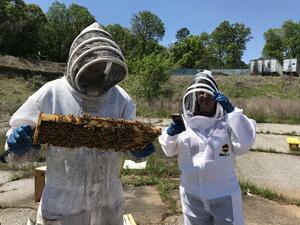 2 beehives quickly turned into 100 and the rest is history. Beekeeping went from a hobby to an addiction. In my normal day job I am a firefighter. I really enjoy helping people and bees just became an extension of that. Q: How is it that you started your own honey company? Q: What are some of the biggest challenges that beekeepers face? Q: How important is it to you that the bees stay local? How are they helping the local environment? Q: Do you plan to expand your honey business? A: (Cloister Honey) They have expanded their focus on creating different flavors of honey, including different whipped, salted, and seeded varieties, not to mention the infused versions they produce through Great River Hemp Co, to encourage all sorts of people to use honey for a wide array of reasons. Q: Where can customers go and find your awesome products? A: We can help out with this one. To find out where these amazing folks sell their bee centric products check their websites, follow their insta, and checkout your local markets. 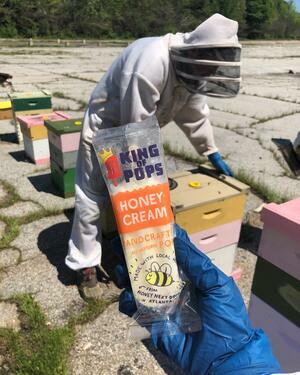 or have us cater your Earth Day celebrations with our Honey Cream Pops. Just click below.